NASA's Radiation Belt Storm Probes are ready to begin space environment testing. 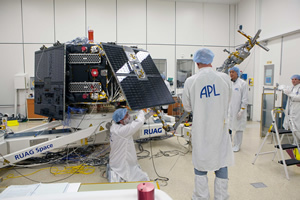 The RBSP team at the Johns Hopkins University Applied Physics Laboratory, shown here in late November, performs final inspections and testing on spacecraft A's solar arrays and one of the mission's five scientific instruments before the satellites head into acoustic testing. 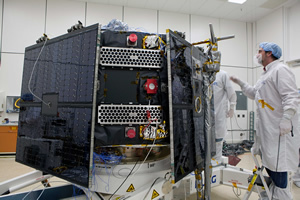 NASA’s Radiation Belt Storm Probes (RBSP), twin spacecraft being built and tested at the Johns Hopkins University Applied Physics Laboratory in Laurel, Md., are about to enter a challenging series of tests designed to certify that they are ready for their August 2012 launch and two-year mission in Earth’s orbit. The coordinated measurements of the two RBSP spacecraft will advance our understanding of space weather and the sun’s influence on the Earth and near-Earth space by probing the planet’s radiation belts, which affect space weather and spacecraft operations. Beginning the first week of December, RBSP will embark on a space environment test campaign that will last into March 2012. 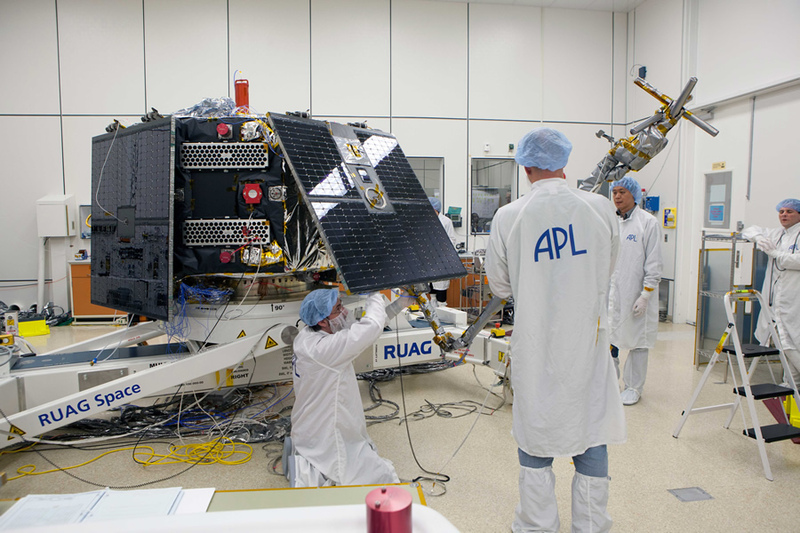 The RBSP team will subject the spacecraft to physical simulations of the stresses of launch and harshness of space operations, but in a controlled test facility where engineers can monitor the spacecrafts’ condition. The first test will simulate the incredibly loud noises generated during launch and the beginning of supersonic travel, when the launch vehicle passes through the sound barrier (approximately 770 miles per hour). These sounds, which can reach a maximum of 134 decibels (nearly as loud as a jet engine from 100 feet away), will be duplicated by a specialized speaker system that is controlled via computer to match the sonic profiles of launch and supersonic barrier breakthrough. The RBSP satellites will be mated together and placed at the center of a circular wall of powerful loudspeakers for this test. One of the substantial challenges for the probes is that they must survive launch as a single unit; later, above Earth, they will be separated and guided to their individual orbits. RBSP is scheduled for launch no earlier than Aug. 15, 2012, from the Kennedy Space Center, Fla. APL built the RBSP spacecraft for NASA and manages the mission. 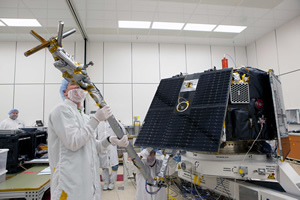 The RBSP mission is part of NASA's Living With a Star program, guided by the Heliophysics Division of the NASA Headquarters Science Mission Directorate in Washington. The program explores fundamental processes that operate throughout the solar system, in particular those that generate hazardous space weather effects near Earth and phenomena that could affect solar system exploration. Living With a Star is managed by NASA's Goddard Space Flight Center in Greenbelt, Md. Learn more about the Radiation Belt Storm Probes, and see photos and videos of space environment testing, at http://vanallenprobes.jhuapl.edu.